Two outfit cars are part of the 1966 winter photography trip sponsored by the Pacific Locomotive Association. 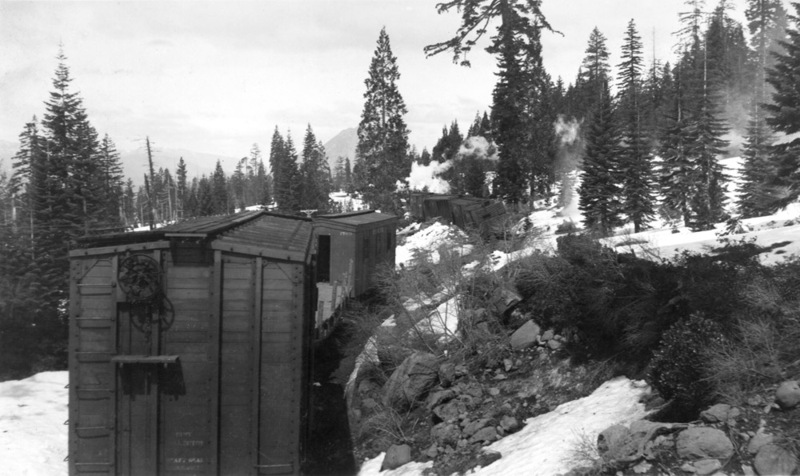 The train is seen here on the Pondosa branch at the Bear Creek bridge. Photo is by and courtesy of Brian Curnow. 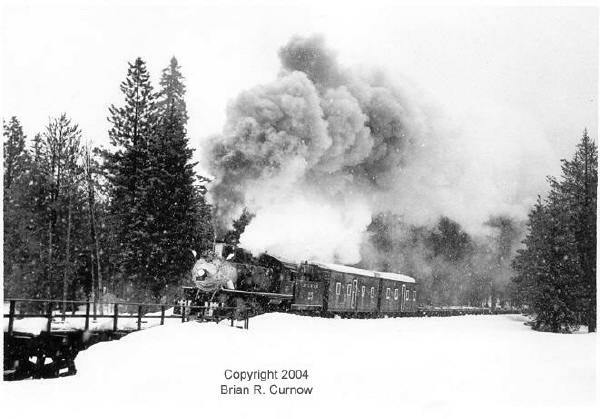 The McCloud River Railroad purchased its first outfit cars during May 1897. 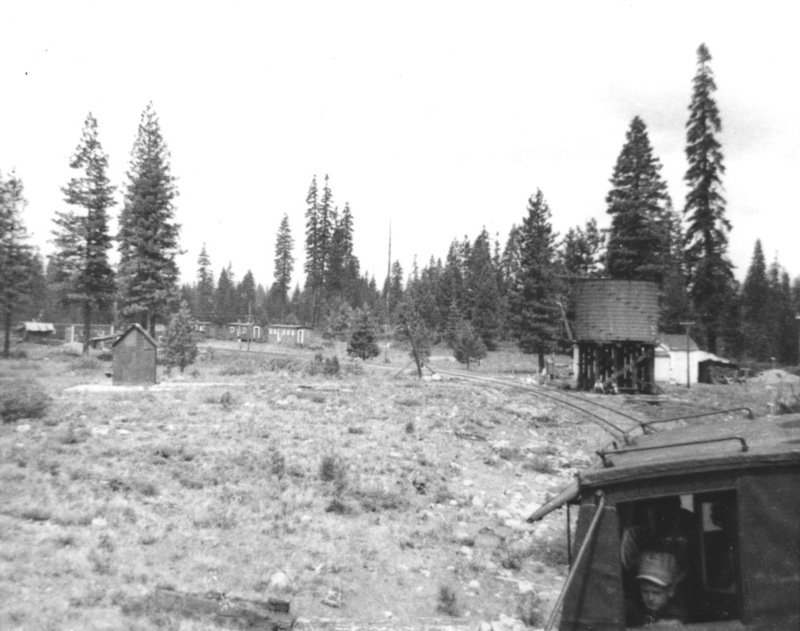 The railroad eventually accumulated a large collection of outfit cars, used mostly to house track construction and maintenance crews and their families along remote parts of the line. The use of outfit cars started to wane at the end of the 1930s as motorized speeders and other technologies allowed the maintenance crews to operate from established section camps. The railroad retired the last of its outfit cars by around the end of World War Two, with most of the carbodies turned into housing for a large influx of mostly Mexican track laborers the railroad hired that could not be accommodated in the housing then available in McCloud. The opening of the Burney line in 1955 prompted the railroad to purchase more outfit cars to house track maintenance employees working on the end of that line. By the early 1960s, these cars too had been brought back into McCloud, where they were used to house employees and their families who were waiting for permanent housing to become available in town. 01- Outfit car, converted 1/1939 from combination car #01. Donated 1964 to a railroad museum to be located near Dunsmuir, CA. Collection accumulated for this museum eventually incorporated into the Railroad Park Resort south of Dunsmuir. Car is presently part of the resort dining room. 02- Outfit car, converted 1/1939 from combination car #02. Retired 9/1941. Trucks salvaged, with the body placed on the ground and converted to a dwelling for the carman assigned to the R.I.P (Repair In Place) track at the log pond. Body burned 1952 to make way for the log pond expansion. Photographs of the #01 and #02 as outfit cars are in the Passenger Car Roster section. 20- Outfit car (Cook). Likely converted circa 1900 from a boxcar. Renumbered 1907 to #1721. 22- Outfit car (Diner). Likely converted circa 1900 from a boxcar. Renumbered 1907 to #1723. 24- Outfit car. Likely converted circa 1900 from a boxcar. Renumbered 1907 to #1725. 26- Outfit car. Likely converted circa 1900 from a boxcar. Renumbered 1907 to #1727. 28- Outfit car. Likely converted circa 1900 from a boxcar. Renumbered 1907 to #1729. 32- Outfit car. Likely converted circa 1900 from a boxcar. Renumbered 1907 to #1709. 34- Outfit car. Likely converted circa 1900 from a boxcar. Renumbered 1907 to #1711. 36- Outfit car. Likely converted circa 1900 from a boxcar. Renumbered 1907 to #1713. 38- Outfit car. Likely converted circa 1900 from a boxcar. Renumbered 1907 to #1715. 40- Outfit car. Likely converted circa 1900 from a boxcar. Renumbered 1907 to #1717. 42- Outfit car. Likely converted circa 1900 from a boxcar. Renumbered 1907 to #1719. 44- Outfit car (Sleeper). Likely converted circa 1900 from a boxcar. Renumbered 1907 to #1747. 46?- Outfit car (Sleeper). Likely converted circa 1900 from a boxcar. Renumbered 1907 to #1749. 550- Outfit car, purchased 12/1959 from Western Pacific (ex-WP #MW 0126-H). Rebuilt, installed shower, and painted green 4/1/1960. 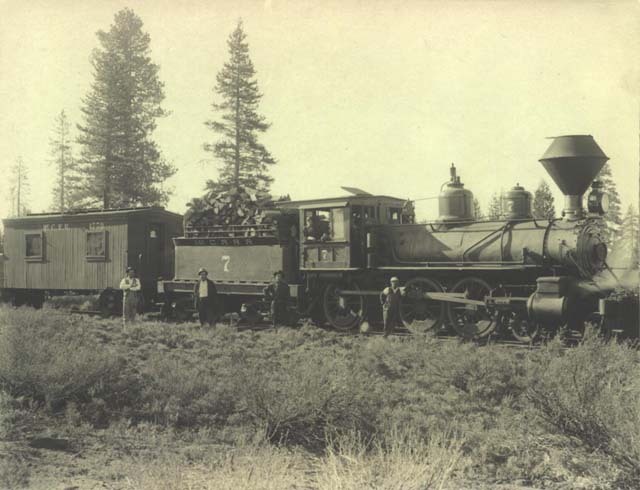 Parked at Bartle until Fall 1960, when the railroad moved it to McCloud. Used to house two employees and their families until retired and burned circa 1966. 551- Outfit car, purchased 12/1959 from Western Pacific (ex-WP #MW 0112-H). Same disposition as #550. Outfit car MR #551. Photo courtesy of Jerry Lamper. 552- Outfit car, purchased 12/1959 from Western Pacific (ex-WP #MX-064-D). Equipped with double doors. Same disposition as #550. Outfit car MR #552. The end of outfit car MR #1853 is visible to the right, with the MR #551 to the left. Photo taken August 1963 by Stan F. Styles and is from the collection Jerry Lamper. 1709:1- Outfit car, formerly #32. Scrapped 1908. 1709:2- Outfit (Diner). Built 4/1908. Cost $507. Install two canvas vestibules 4/1916, cost $5.52 labor and $4.54 materials; install one bunk 12/1916, cost $0.41 labor, $7.35 bunk, and $1.49 freight. Retired 6/1942. Body converted into temporary housing in McCloud. 1711:1- Outfit car, formerly #34. Scrapped in 1908. 1711:2- Outfit (Diner). Built 4/1908. Cost $507. Retired 4/2/1932. 1713:1- Old outfit car, formerly #36. Scrapped in 1907. 1713:2- Outfit (Commissary). Built 11/1907. Cost $535. Retired 6/1942, with body converted to temporary housing in McCloud. 1715:1- Outfit car, formerly #38. Scrapped in 1907. 1715:2- Outfit (Commissary). Built 11/1907. Cost $535. Install one vestibule 4/16, cost $2.76 labor and $2.27 materials; install partitions 12/1916, cost $2.74 labor and $5.27 materials; install shelves 12/1916, cost $19.84 labor and $6.69 materials; install meat house 12/1916, cost $3.99 labor and $14.15 materials; install one bunk, cost $0.41 labor, $7.35 bunk, and $1.49 freight. Retired 7/1945. 1717:1- Outfit car, formerly #40. Scrapped in 1907. 1717:2- Outfit (Diner). Built 11/1907. Cost $535. Retired 11/1936. 1719:1- Outfit car, formerly #42. Scrapped 1907. 1719:2- Outfit (Diner). Built 11/1907. Cost $535. Install one vestibule 4/1916, cost $2.77 labor and $2.26 materials. Retired 12/5/1932. 1721- Outfit car (Cook). Formerly #20. Built before 1906. Book value $400. Retired 4/2/1932. 1723- Outfit (Diner). Formerly #22. Built before 1906. Book value $400. Install two vestibules 4/1916, cost $5.52 labor and $4.54 materials. Retired 11/1947, with body converted to an employee dwelling at Car A. The bodies of several outfit cars, including the #1723, at Car A in June 1950. Jeff Moore collection. 1725:1- Outfit car, formerly #24. Scrapped 1908. 1725:2- Outfit (Diner). Built 4/1908. Cost $507. Install one vestibule 4/1916, cost $2.77 labor and $2.26 materials. Retired 6/1942, with body converted to temporary housing in McCloud. 1727:1- Outfit car, formerly #26. Scrapped 1908. 1727:2- Outfit (Sleeper). Built 4/1908. Cost $507. Install eight bunks 12/1916, cost $3.28 labor, $58.80 bunks, and $11.92 freight. Retired 5/1947. 1729:1- Outfit car, formerly #28. Scrapped 1908. 1729:2- Outfit (Commissary). Built 4/1908. Cost $507. Retired 11/1/1933. 1731:1- Outfit car, converted prior to 1906 from lumber flat #491. Scrapped 1908. 1731:2- Outfit (Sleeper). Built 4/1908. Cost $507. Retired 6/1942, with body converted to temporary housing in McCloud. 1733:1- Outfit (Work). Converted before 1906 from flat #509. Cost $535. Retired 2/1910. 1735:1- Outfit car, converted prior to 1906 from lumber flat #415. Scrapped 1907. 1735:2- Outfit (Sleeper). Built 11/1907. Cost $535. Retired 11/1947, with body converted to an employee dwelling at Car A. 1737- Outfit (Sleeper). Converted before 1906 from lumber flat #439. Book value $400. Install eight bunks 12/1916, cost $3.28 labor, $58.80 bunks, and $11.92 freight. Retired 10/1936. 1739- Outfit (Sleeper). Converted before 1906 from lumber flat #485. Book value $400. Install eight bunks 12/1916, cost $3.28 labor, $58.80 bunks, and $11.92 freight. Retired 6/1942, with body converted to temporary housing in McCloud. 1741- Outfit (Sleeper). Converted before 1906 from lumber flat #505. Book value $400. Retired 2/1929. 1743- Outfit (Sleeper). Converted before 1906 from flat #525. Book value $400. Install one vestibule 4/1916, cost $2.76 labor and $2.26 materials; install one bunk 12/1916, cost $0.25 labor, $7.35 bunk, and $1.49 freight. Retired 6/1942, with body converted to temporary housing in McCloud. 1745- Outfit (Commissary). Converted before 1906 from flat #531. Book value $400. Install two vestibules 4/1916, cost $5.52 labor and $4.54 materials; install one bunk 12/1916, cost $0.41 labor, $7.35 bunk, and $1.49 freight; install sink and drain board 12/1916, cost $9.81 labor and $3.67 materials; install ventilators 12/1916, cost $29 labor and $3.67 materials; install water system 12/1916, cost $10 (two tanks), $4 (two A.B. hoses), $2.25 (2.5 pounds rainbow padding), $6.44 (faucets), $0.66 (11 feet 1â€� pipe), $10.26 (miscellaneous and plumbing materials), $0.91 (store expenses), and $60.93 (labor). Retired 6/1942, with body converted to temporary housing in McCloud. 1747- Outfit (Sleeper). Formerly #44. Built before 1906. Book value $400. Retired 7/1945. 1749- Outfit (Sleeper). Formerly #46? Built before 1906. Book value $400. Install eight bunks 12/1916, cost $3.28 labor, $58.80 bunks, and $11.92 freight. Retired 7/1945. 1757- Outfit (Sleeper). Built 9/1908. Cost $524.83. Install eight bunks 11/1916, cost $3.28 labor, $58.80 bunks, and $11.92 freight. Retired 10/1936. 1759- Outfit (Work). Built 9/1908. Book value $500. Install three bunks 12/1916, cost $1.23 labor, $22.65 bunks, and $4.47 freight. Retired 2/1919. Outfit car #1759 as part of a work train. Heritage Junction Museum of McCloud, Inc.
1761- Outfit (Cook). Built 9/1908. Cost $500. Install eight bunks 11/1916, cost $3.28 labor, $58.80 bunks, and $11.92 freight. Retired 6/1942, with body converted to temporary housing in McCloud. 1763- Outfit (Cook). Built 5/1909. Cost $500. Retired 6/1942, with body converted to temporary housing in McCloud. Outfit car #1763 as part of a work train cleaning up a derailment not far above Mt. Shasta City. From the T.E. "Eddy" Glover collection. 1777- Outfit (Bath). Built 12/1926. Cost $1,497.23. Retired 10/1936. 1779- Outfit (Sleeper). Built 1/1927. Cost $1,531.23. Retired 6/1942, with body converted to temporary housing in McCloud. 1853:2, 1854, 1855:2, 1856, 1857:2, 1858- Boarding cars, purchased 4/1955 from Southern Pacific. Cost $3,296.00. #1853:2 formerly SP #824; #1857:2 formerly SP #3333; and #1858 formerly SP #3477. #1853 painted on 11/6/1959. All cars retired and scrapped circa 1966. 2977- Outfit car. Converted by 2/5/1957 from log flat #2977. Damaged by two runaways, the first involving log flats on 7/5/1957 and the second at Berry on 11/1/1957. Disposition unrecorded, but likely by 1965. - Bodies from #1717, #1737, #1757, and #1777 converted to section house at Esperanza, tool house at Bartle, and tool house and bunk house at Car A upon their retirement in the fall of 1936, but company records do not specify which body went to which place. - Other definitive secondary uses of outfit car bodies include one converted to a section house at Signal Butte circa 1938 and one converted to a shower building in McCloud in 1943, but company records do not indicate from which cars the company salvaged these bodies. - Possible secondary uses of retired outfit car bodies include three section cabins at Howard, a section foreman's dwelling in McCloud, three section cabins at McCloud, and a section foreman's dwelling at Car A, all building erected in 1941 that have the same basic specifications as outfit cars. However, these could also be cabins built to fit on flatcars.